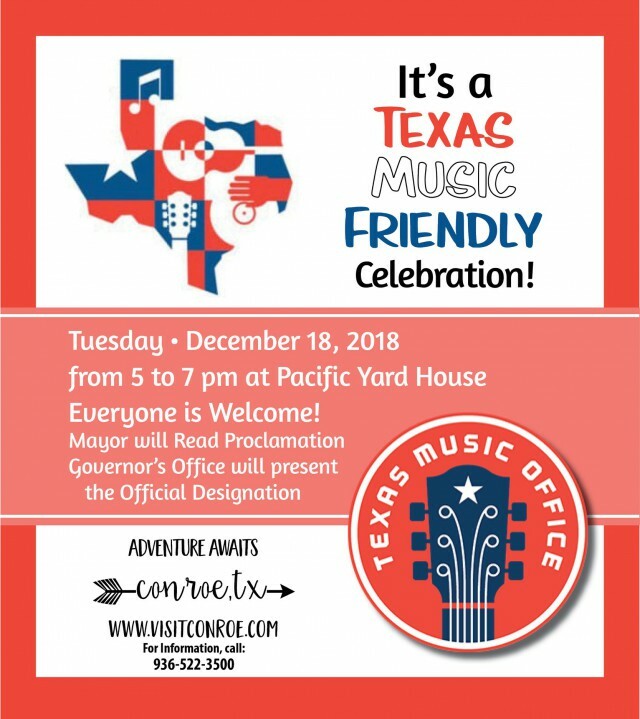 On Tuesday, December 18, 2018, The Texas Music Office will certify Conroe - one of the fastest growing cities in the United States - as the seventh city to be certified as a "Music Friendly Community" at a celebration ceremony from 5:00 – 7:00 p.m. at Pacific Yard House. The public is invited to attend this free event. Shannon Overby, director of the Visit Conroe convention and visitors bureau, notes that the program will help the city partner with the community to connect various musical entities—nonprofits, music education, musicians, venues and producers—through a collection of contact information. "The Texas music industry generated over $19.8 billion in economic activity and created over 178,000 direct and indirect permanent jobs in communities all across the Lone Star State last year, with support from the Texas Music Office,” said Governor Greg Abbott. “Music Friendly Communities certified by the Texas Music Office are serious about attracting and developing local music industry growth, and I am proud of all that the Texas Music Office has accomplished in helping communities like Conroe grow their local economy." Conroe joins other Texas cities that have received the official Music Friendly Community designation from the Texas Music Office, including Lindale, Fort Worth, Austin, San Antonio, and Denton. Conroe Mayor Toby Powell will be in attendance and read a proclamation. Performing artist Kenna Danielle will open the event with a short performance at 5 pm. Performing artist Jason Allen will headline the event with a performance at 6 pm.